VideoDuke is an online video downloading app offering high speed and simplicity of usage. 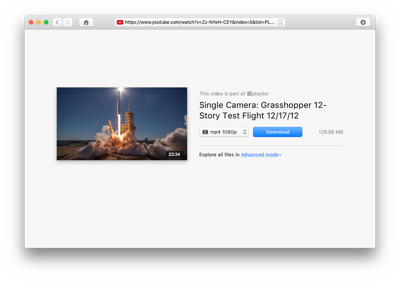 You can save a wide range of video formats, e.g. 3GP, MP4, M4V, FLV, in a desired resolution including HD, 4K and 8K videos. You only need the link to your online video to get it on your computer: just insert it in the URL box and the software will detect it on the page and offer you to save the content in the best available quality: 1080p, 720p, 540p or 360p. If you need to save some space on your hard drive - choose a lower resolution, and on the contrary - when you are going to watch your video on big screen - don't hesitate to save it in the best resolution offered. Once you have selected the most suitable settings for your video download, go ahead and click the "Download" button. Want to download more than one file? No problem - download as many as you like! VideoDuke supports more than 1000 websites including Dailymotion, YouTube, Vimeo, Twitter, and has a browser mode to search for videos directly from the app. You can use quick buttons to access YouTube, Vimeo and Dailymotion from the main app window, bookmark favorite pages, etc.